Anglers around the world recognize the advantages of a higher line-of-sight and a dependable watercraft that can access places no other craft can go. Combining design ingenuity and feedback from those anglers, Native Watercraft built a stand-up paddleboard model which possesses all of these advantages. The Native Watercraft Versa Board Angler stand up or sit down paddleboard features an extremely stable hull that offers surprising performance and handling in surf, the open ocean, rivers, or lakes. The deck is broad and wide to provide plenty of room for coolers or other fishing gear without restricting standing space. Its unique, retractable spring loaded skeg system provides exceptional tracking while in flatwater or while riding a wave but can be easily retracted when in the shallows. The Versa Angler comes with a center-mounted groove track and fore and aft deck bungees with recessed hardware. Unlike fiberglass, this roto-molded polyethylene SUP is durable and affordable. The Versa Board board combines tried-and-true design elements with modern innovation. SUP + Kayak = SUPYak? Ok, first the pros: I love the minimalistic design; the color and fit and finish are excellent; the sit down comfort with the swivel seat with upgraded first class seat covers is the best in the business; everyone loves it and asks what it is; it's extremely stable and easy to stand on; the transport wheel works great on cement/hard pack; the drop down, spring loaded skeg helps tracking immensely; the weight isn't bad for a kayak; grove track adds easily accessible no-drill accessory mounting locations and it's just a really beautiful kayak in the blue lagoon color! It's great for minimal kayaking/standup going downstream, the ability to sit or stand makes it very versatile and excellent for a full body workout and kids and dogs love the stability and open deck space/design (and adults and fishermen/women too!) Ok, to be fair, now the cons: The hull glide is pretty awful with this board/yak - when standing, it goes nowhere when your paddle isn't pushing water, and when sitting and paddling, it isn't much better. Open water, wind, current and distances are not your friend and you will tire easily in these conditions; the rear wheel isn't good on soft surfaces; side handles! I always find myself reaching for side handles when moving this board around, and there are none, which makes it much more awkward to move around and makes it seem heavier than it is; while the swivel seat is awesome, the price isn't - $309 for the basic sling version, and then add another $120 or so for the upgraded First Class Seat covers, which makes for a really pricy seat! (Still, it is beyond compare for comfort, and I've owned or tried almost all of them, including the Hobie Vantage seats.) So my final verdict? This is an excellent minimalist kayak/SUP/all around playboard with great stability and everything you need to have a blast on the water, as long as you don't need to get there quickly or cover great distances in wind and/or current. (And with the swivel seat with First Class Seat covers, you'll do it in style and comfort!) It truly is a Versa Board! Redesign the hull with more glide built into it, and it would be one of my favorite all around paddle kayaks! Very stable, great fishing platform. It's not fast so I would not use it for long distance outings, but the versatility to use it as a kayak or paddleboard is great. The negatives are that it is a noisy watercraft. Due to the shape of the hull, there is a lot of water slap noise against the hull in anything but very calm waters. Also, I had to install side grab handles because this board doesn't have any. Side handles make lifting the board by myself much easier than the single center handle. Last, you have to purchase an additional seat unless you want to be sitting in a puddle of water in the indented seat that's molded into the hull. I purchased the expensive first class swivel seat. The board is AMAZING!!! - would be even better if maybe there were handles on the sides of the board for easier two person transport?....or better grip or positioning on the ends of the board. While the wheel is GREAT - sometimes we need to carry a longer distance. It is awkard to carry with the handles on the ends of the board. Super stable, easy to go from standing to sitting and back on the water. Great for river and flats fishing, lots of fun in the surf too. This boat is awesome! The Versa board has great stability both as a kayak and as a SUP. The rudder is a great addition, it really helps you keep going straight, even against the wind. Also, the wheel at the back is genius, it makes it so much easier to transport by yourself. Nothing wrong with it at all. 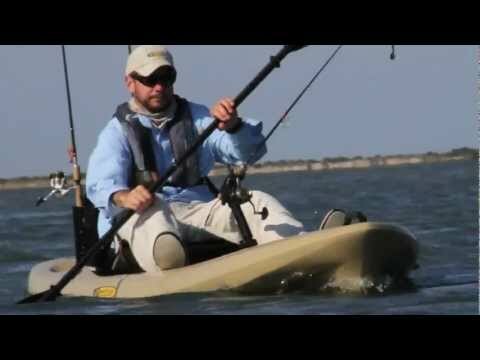 The Versa Board Angler is exactly what we were looking for in a hybrid SUP/Kayak! It truly acts as both a versatile SUP with great stability and a ready angling partner with great fishing capability. The Versa gets daily use from our home on an ocean bay in New England. We would recommend the Versa to anyone looking for true hybrid performance in a rock solid configuration! A: Length: 12'3" Width 33" Weight 55 lbs Capacity: 300 lbs. Q: Can you stand in this kayak pretty easily? A: The Native Watercraft Versa Board Angler 12-3 is designed to be a crossover between a SUP and a kayak, so the shape of the hull is designed to make it stable while standing. Q: Does the Versa Angler 12-3 have dry storage compartments? A: It has one 6" hatch on the rear only. Q: does the Versa 12-3 have drainage scuppers?